With the proper tools people have the power to influence the course of chronic disease. Our digital tools coach people through exercise protocols designed to improve Parkinson's disease symptoms and delay disease progression. The goal of our analysis is to run statistical tests to quantify the behavioral improvement for subjects that have participated in the exercise program and circleTap™ finger tapping tests. Rapid Advancements in Mobile and Sensor Technology are Providing New Opportunities to Improve Population Health Cost-Effectively, Including Parkinson’s Disease (PD). There are currently no pharmacological solutions that cure PD, and the primary treatment- levodopa- loses efficacy over time.1 There is growing evidence that exercise, and cycling in particular, may positively impact the symptoms and disease progression of Parkinson’s disease by stabilizing essential tremor and muscle weakness.2,3 However, the most effective exercise program for improving PD symptoms has not yet been established. Beneufit’s approach features exercise protocols derived from the research of Dr. Jay Alberts of the Cleveland Clinic, which showed that a high cadence cycling protocol improved Unified Parkinson’s Disease Rating Scale (UPDRS) scores by 35%.4 The goal is to achieve a heart rate between 75% and 85% of maximum and cycling cadence of 90 RPM. When following this protocol, users of our PD-specific application (pdFIT™) have exhibited statistically significant improvements in proprietary measures of manual dexterity (circleTap™ finger tapping test) and in overall physical fitness (fitFactor™), over the course of a 2-year pilot study. Figure 1. pdFIT™ Select Protocol screen with protocol name, description and duration. Beneufit's fitFactorTM score is a representation of how closely a person adheres to a workout protocol. The fitFactor score is defined algorithmically according to how closely a peron’s’s actual heart rate and cadence followed the prescribed level. Figure 2. pdFIT™ Workout screen with target and actual heart rate and cadence readings. fitFactor™ Score = (protocol percentage adherent x protocol difficulty). The Beneufit circleTap™ finger tapping test allows people to periodically assess manual dexterity and fine motor control on their own through the pdFITTM app(Figure 3). This data is for their personal use and may be shared with their physician or care provider. Figure 3. pdFIT™ circleTap finger tapping test interface with tap buttons 1 and 2. To conduct the tap test, a person tracks and taps two targets labelled “1” and “2” in four separate 15-second intervals. A finger tap that successfully contacts the colored circle is considered a hit. A miss is when the finger contacts outside the colored circle. The total number of hits and misses is calculated upon test completion and is displayed along with the aggregate circleTap score of hits minus misses. Thus, circleTap™ score = total hits - total misses. 2. Marusiak, J., E. Żeligowska, J. Mencel, K. Kisiel-Sajewicz, J. Majerczak, J. Zoladz, A. Jaskã3Lski, and A. Jaskã3Lska. "Interval Training-in- duced Alleviation of Rigidity and Hypertonia in Patients with Parkinsonâ€TMs Disease Is Accompanied by Increased Basal Serum Brain-de- rived Neurotrophic Factor." J Rehabil Med Journal of Rehabilitation Medicine 47.4 (2015): 372-75. Web. 3. Uygur, Mehmet, Maria Bellumori, Kevin Lenoir, Kendall Poole, Ingrid Pretzer-Aboff, and Christopher A. Knight. "Immediate Effects of High-speed Cycling Intervals on Bradykinesia in Parkinson's Disease." Physiotherapy Theory and Practice 31.2 (2014): 77-82. Web. 4. Alberts, J.L., Linder, S.M., Penko, A.L., Lowe, M.J. & Phillips, M. It is not about the bike, it is about the pedaling: forced exercise and Parkinson's disease. Exercise and sport sciences reviews 39, 177-186 (2011). Beneufit uses Bluetooth Low Energy (BLE) fitness sensors to coach people through protocols. Sensors commmunicate real-time heart rate and cycling cadence values to the pdFIT™ mobile application. Any BLE sensor following Bluetooth’s GATT specifications will work with pdFIT™. Figure 4. Mio LINK heart rate monitor and Wahoo RPM cadence sensor. Beneufit users’ individual circleTap™ test scores over a two-year period from May 2014 through April 1016. Some users have taken hundreds of these self-administered tests. The data shows a statistically significant improvement in motor control (as measured by cirlceTap™ scores) over the two-year period. Figure 5. Individual users’ circleTap™ test scores showing every test taken for each person over the two year period. The advantage of the Beneufit circleTap™ Test is the variable length between the tapping targets introduced mid-session of test potentially reducing the learning effect. Thus the Benuefit tap test is designed for hightended sensitivity to provide Parkinson’s disease patients with as much accurate information of their physiological improvement from exercise. Figure 6. From left to right, the AHTD computerized assessment battery, Kinetics Foundation computer keybord test and Apple's ResearchKit mPower test. 6. Memedi M, Khan T, Grenholm P, Nyholm D, Westin J. Automatic and Objective Assessment of Alternating Tapping Performance in Parkinson’s Disease.Sensors (Basel, Switzerland). 2013;13(12):16965-16984. doi:10.3390/s131216965. 7. Nutt J, Lea ES, Van Houten L, Schuff RA, Sexton G.Determinants of tapping speed in normal control subjects and subjects with Parkinson's disease: differing effects of brief and continued practice.Mov Disord. 2000 Sep;15(5):843-9. 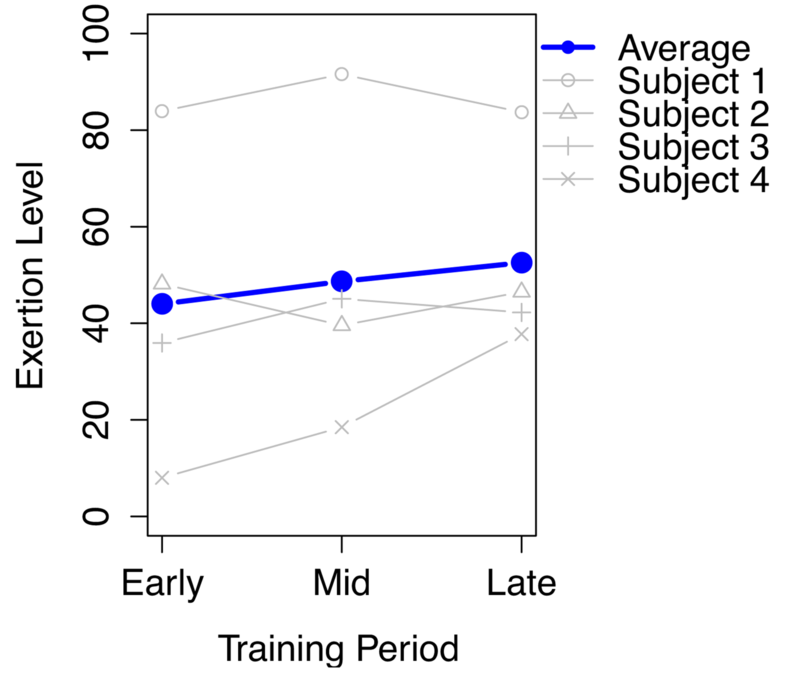 Statistically significant improvement in circleTapTM finger tapping test scores over the two year period. On average, circleTap™ scores increased by 13% from Early to Mid training and 19% from Mid to Late training. 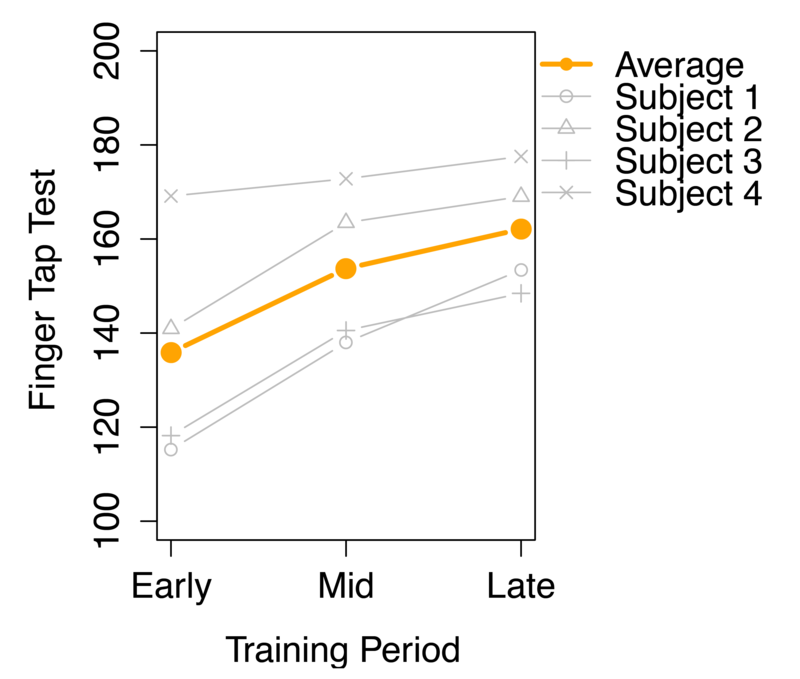 Statistical significance denoted as p<0.05. Figure 7. circleTapTM scores showing improvement in motor control over a two year period. Statistically significant improvement in fitFactor™ scores of fitness exertion level over the two year period. On average, Exertion Level increased by 11% from Early to Mid training and 20% from Early to Late training. Figure 8. fitfactor™ scores showing improvement in exertion level over a two year period. These charts show effect of tap test progress longitudinally between the Parkinson’s disease (PD) group and the control group. The PD group shows improvement over time and clusters up and to the right while the control group experiences no perceptible improvement. Figure 9. circleTap™ scores showing improvement only in the Parkinson’s disease group. Significant improvement is shown in tap test results with the affected hand and none for the other hand. Since this person is right handed the overall score is higher for the right land. 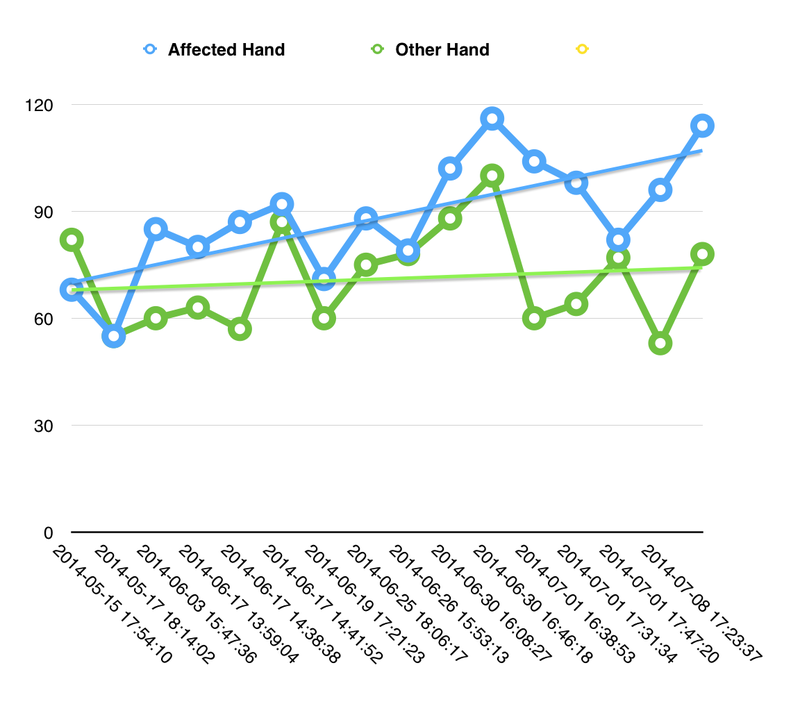 Figure 10. circleTap™ scores showing improvement only in affected hand. Are you or your organization interested in advancing the understanding of how exercise and technology can impact Parkinson's Disease symptoms and disease progression?